The more we learn about the Apple Watch, the less it seems like a revolutionary departure from the existing wearable market. 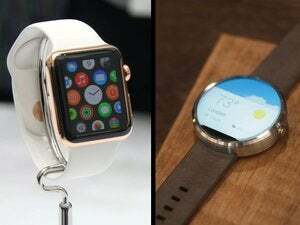 In particular, it has a lot of overlap with Android Wear, Google’s own wearable platform. That much became clear last week, when Apple released its design guidelines for third-party apps. Parsing the guidelines alongside those for Android Wear reveals two like-minded approaches: quick, contextual interactions are paired with data collection from sensors. 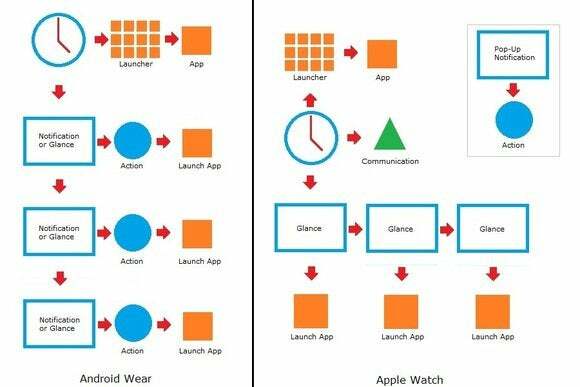 This isn’t to say Android Wear and the Apple Watch are exactly the same. Even if they’re trying to arrive at the same place, they manage to head down diverging paths along the way. 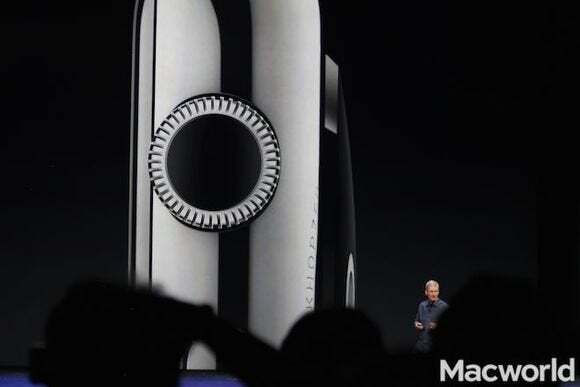 Behold: The Apple Watch "Digital Crown." On a basic level, the Apple Watch and Android Wear are both driven by actionable notifications—such as the ability to delete an email or respond to a message straight from the watch—as well as information cards that you can quickly glance at. The primary difference appears to be in the way everything’s laid out. Android Wear’s interface is like a big spinal cord, with glanceable cards, actionable notifications and even music playback controls mashed up into a single, vertical menu. Swiping to the right of any notification brings up potential actions (such as delete and reply buttons for email). In some cases you can launch a proper watch app from its corresponding notification. The Apple Watch takes a more tentacled approach. Instead of combining glances and notifications into a single column, the two are distinct entities. When you want a quick hit of simple information, such as a current stock price or sports score, you swipe up to the Glances section, then swipe across to the info card you’re looking for. Tapping on a Glance leads to its corresponding app if you want to do more. Notifications on the Apple Watch are more fleeting, popping up with only minimal information at first. If you tap the screen or keep your wrist raised, more information and possible actions appear. Otherwise, the notification disappears. Android Wear and Apple Watch interface flows, visualized. There are pros and cons to both approaches. Android Wear’s single stack of cards seems simpler to navigate, and it allows apps to push out glanceable information only when it’s going to be helpful (such as when a sports score changes). On the other hand, Apple gives users more control over what they’re looking at and more privacy for incoming notifications. Apple’s interface also prevents users from having a big pileup of unaddressed notifications to wade through. Both systems tackle the same overarching concepts in slightly different ways. The two platforms diverge even more dramatically in the way you’re asked to launch deeper apps, such as to-do lists, music players and fitness trackers. The Apple Watch has a traditional home screen for this purpose, accessed by tapping the “Digital Crown” on the right side the watch. Android Wear has an app launcher as well, but it obfuscated by design. To access it, you have to tap the screen from the main watch face, then swipe all the way down to the bottom of a list of options. It’s possible to launch apps with a voice command, but Google’s guidelines make clear that most apps should jump into the notification stack automatically, presenting themselves at just the right moment based on context signals such as time, location or physical activity. Apps on Android Wear and the Apple Watch will also have a more fundamental difference, at least at launch: On the Apple Watch, third-party apps will require a paired smartphone to operate until Apple allows for fully native apps later in 2015. (It’s not clear which of Apple’s own apps, if any, will be subject to these restrictions.) By offloading computational tasks and storage to the phone, Apple Watch apps can run smoother with less drain on battery life. 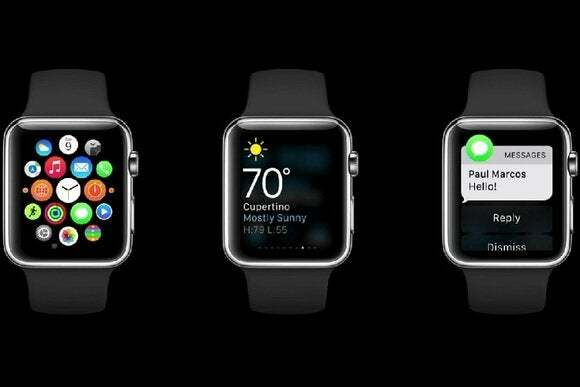 Apple Watch’s app launcher, Glances and actionable notifications. Android Wear apps can be loaded directly on the watch, and while most apps require a phone connection to be useful, the system already allows for the independent operation of basic utilities (such as calculators and checklists) and offline music playback. Android Wear watches with GPS on board can also keep track of your location, speed and distance traveled without a paired smartphone. It seems likely that the differences in these approaches will become less pronounced over time. 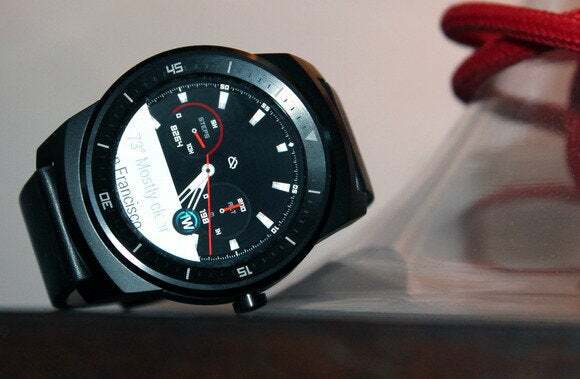 A future update for Android Wear is rumored to make launching apps easier, and Apple Watch apps may not need to rely so much on a paired phone as Apple’s hardware becomes faster and more efficient. 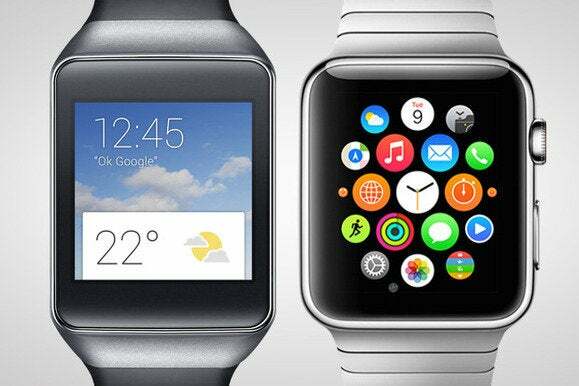 Several other factors set Android Wear and Apple Watch apart. The most obvious difference is the hardware itself, with Apple focusing on a single device (in two sizes) and Google working with hardware partners on a wide variety of shapes, sizes and prices. By controlling the hardware, Apple is placing a bigger bet on new interaction models, such as the Digital Crown for non-touch controls and Force Touch for pressure-sensitive touch commands. The manly looks of LG’s G Watch R isn’t for everyone, but Android Wear isn’t bound to one style. The Apple Watch also has the advantage in mobile payments through its support for Apple Pay, which is already gaining traction among iPhone users. Google has its own mobile wallet service, but hasn’t announced Android Wear support, and no current watches have the necessary NFC capabilities built-in. 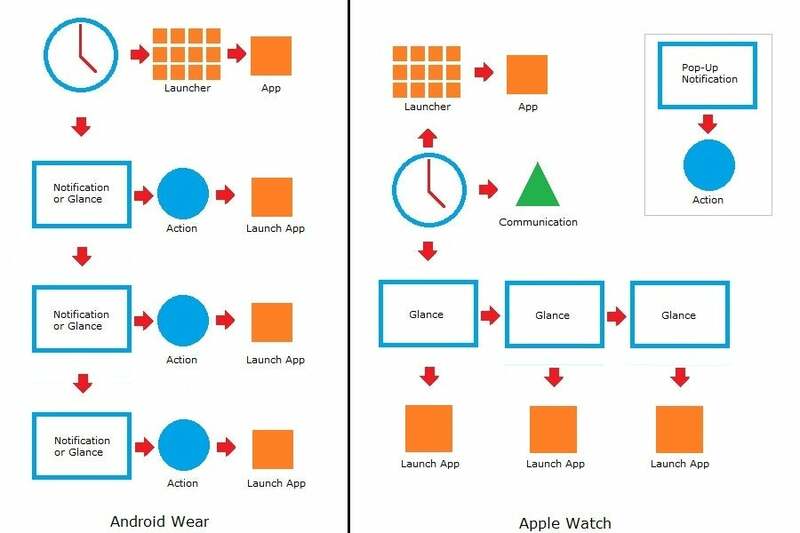 But despite all these differences, the Apple Watch and Android Wear don’t seem fundamentally different. They both, in essence, try to save us the trouble of using our phones by delivering quick bursts of information, and acting as collectors of data (fitness data in particular) to help us live richer lives. In doing so, they ensure that the Apple-Google rivalry will be just as fierce on wearables as it has been on smartphones.